Good news, fungus fans! After a lengthy wait of approximately five thousand years, the print version of Talking About Fungus – now with a spiffy new cover that actually relates to the book – is now available! It’s currently available on Amazon’s “Createspace” site, and will be up on the Amazon main page within, if the legends be true, 3-5 business days. And if that’s still not enough fungus for you, the T.J. Baer Shop (est. 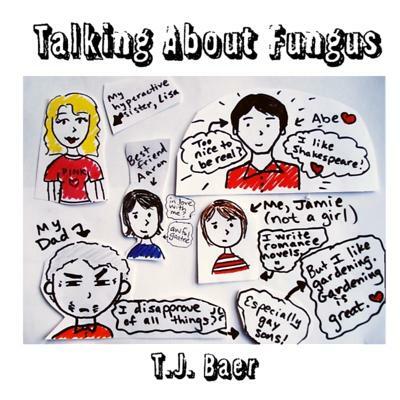 Yesterday, 2014) now carries a Talking About Fungus T-shirt! WOW! What an unexpected merchandise tie-in! And how convenient for those ardent fans whose deepest desire is to have my poorly drawn doodles on their chests for all the world to see! In other news, my Chosen beta-readers (a very official word meaning “friends who have been pressured into reading my lengthy LGBT fantasy epic and giving me some feedback on it”) are beta-reading, and I’m doing a great deal of editing and reading and reading and editing. And, contrary to every natural impulse in my body, cleaning. Why, you may ask, would anyone with a comfortable chair and internet access subject themselves to something as miserable as cleaning? Well, my mother is coming for a visit this week, and that means that I have to extricate myself from my usual life of squalor and offer the illusion that I live in an apartment that occasionally gets cleaned. This evening’s To Do List will involve a great deal of dusting, sweeping, and scrubbing of gunk out of horrifying places, but hopefully by the end of it, I’ll have created an environment that I won’t be ashamed to let my mother set foot in. And, of course, as soon as she leaves, I’ll likely lapse back into my usual disgraceful and dusty existence, but for a few golden, glorious days, I shall live in a world of CLEAN. I’m off to find out. Boo-yah.